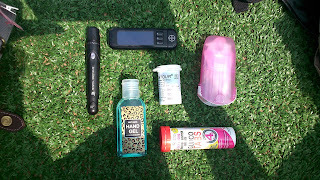 Festival Essentials - Diabetes Survival Kit | Life, Sport and Diabetes - An everyday look at my life with type 1 diabetes. Whilst being great fun, festivals can be tricky places for people with diabetes. With the bag searches upon entry and the explanations of diabetes, to the hot weather conditions, the expense and the lack and availability of good food and toilets (and we all know people with diabetes do go a lot). Having just attended Wireless the best advice I can give is to be prepared for the festival before you go, in order to help minimise the possibilities of coming into difficulty. My own preparation for wireless began with reading the instructions included with the tickets. This told me that if you had proof of your diabetes, then you were allowed to take in food to the event. Which is especially important if you're not sure what food is going to be available at the festival or the cost of it. I took sandwiches and other foods that wouldn't melt or go off in the heat. As the last thing you want is to carry the food all day and be unable to eat it. The food in the venue itself was very expensive, more even than I would have expected. For example it was £3.00 for a bottle of water and the temperature at it's highest was over 30 degrees. And it was £7.00 on average for a hotdog on it's own. Most importantly, if you were to have a hypo- in an emergency you may not have been able to get through the queues at the food stalls, in time to treat it. I don't tend to drink much alcohol anyway through personal choice and because of athletics, but there was mostly beer available. I don't stand on my soap box when I say this, as I appreciate that this is how some people have a good time at festivals- by drinking. But as alcohol dehydrates you and messes with your blood sugars a lot, water would need to be taken on board and regular blood checks completed. 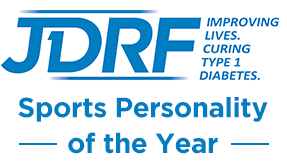 But seeking prior advice from a trained medical professional on the topic or seeking advice from a website such as Diabetes UK is always advisable. For water I would advise taking an empty bottle, as there were 'water stations' available at different locations for you to re-fill the bottle for free. Once you're in the festival the last thing you want to do is leave early because of hypos etc. As there was a possibility liquids might not be allowed in, I chose to carry dextrose tablets that come in an air tight, water-proof container. This way there was no possibility of them getting wet or damaged. I tend to carry two of the contents of my diabetes kit, as I always think that if you have to use the first set you'll always have a spare. It's always a good idea to inform the people you're going with that you have diabetes. And also to carry an 'I have diabetes' card or wear a medi-alert item just in case you get separated from your group and something happens. But most importantly, have a fun and safe time!